In Rangitāne tradition, Te Apiti, or the Manawatu Gorge, was created when a supernatural being - Okatia - taking the form of a giant tōtara, wandered from the Puketoi ranges in search of a new home. Confronted by the barrier of the Tararua and Ruahine ranges, Okatia forced his way through, forming the gorge running between the two mountain ranges. 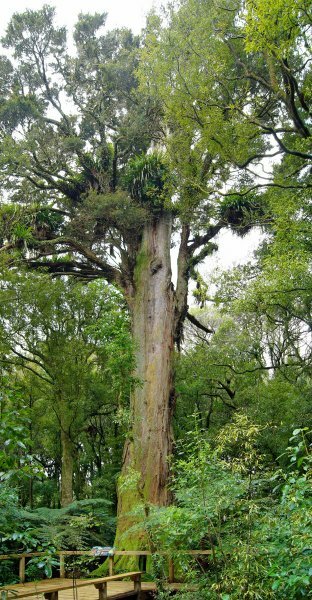 At the Woodville (east) side of the Manawatu Gorge Scenic Reserve a fine tōtara tree is a highlight of the Manawatu Gorge Loop track. A short track and observation deck next to the tree were completed in 2011 (Smillie, M. 2012). Typical of old growth totara. Ten metre bole tapers noticably above a burl on the lower trunk. 02 Oct 2012 Smillie, M.J.
On the Manawatu Loop Track (also known as the Tōtara Loop Track). The entrance is from the signposted Ballance Gorge Road car park. The quickest way to reach the tree is to turn left onto the loop track from the car park. Five to 10 minutes easy walking reaches the unlabelled, but obvious, short (50 m) branch track leading to the tree.